To Sum It Up: Diabolics like Nemesis are bred to protect a single human—and to kill anyone who poses a threat to that individual. Nemesis must do whatever is necessary, including sacrifice herself, to keep Sidonia von Impyrean, the daughter of a galactic senator, safe. When Sidonia’s father angers the galactic emperor, the latter retaliates by summoning Sidonia to court. It’s Nemesis, however, who assumes Sidonia’s identity and goes in her place. At court, Nemesis must navigate potentially lethal politics in order to guard her secret and Sidonia’s life. 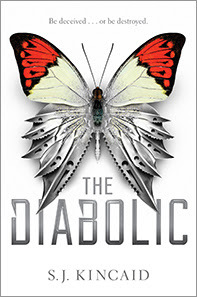 Review: Promotion for The Diabolic around its release date drew my attention to the book, so when the opportunity to read it popped up, I totally went for it. A cool cover and a protagonist named Nemesis? Sign me up! Nemesis certainly lives up to her daunting name. She is a Diabolic, engineered to protect only Sidonia von Impyrean, the daughter of a galactic senator, at all costs. Nemesis is a born killer, and her unique skill set is on display several times throughout the book. Nemesis and Sidonia inhabit a futuristic world where scientific advancement is banned and the elite Grandiloquy, led by the galactic Emperor, wield all the power. Politics are brutal in this world, and gentle Sidonia, the heir to her father’s title, is not cut out for them. So when the Emperor orders Sidonia to the galactic court as punishment for her father’s misdeeds, it’s Nemesis who’s sent in her place. All of the preparations involved in pulling off the impersonation reminded me of the transformation the main character in Pierce Brown’s Red Rising must undergo to also infiltrate the upper echelon of society. Unfortunately, I ended up having some of the same issues with The Diabolic that I had with Red Rising. I’d seen some other reviewers mention that The Diabolic got off to a slow start for them and then picked up. I definitely found the pacing slow at the beginning, but it never gained any momentum for me. I also found the world-building rather thin, with a heavy reliance on titles to differentiate social rank. The details of the world just scratched the surface of it; I never felt immersed in it. Politics and intrigue at the galactic court, which often resembles the Roman Empire with all of the debauchery that goes on there, take up a lot of the book. That would have been fine if there also hadn’t been so much telling. I couldn’t find much investment in the plot or the characters. I kept reading, hoping that I’d finally discover some aspect of the novel that would spur me on to read, but alas, I slogged through to the end. Something that I do think the book does well is examining Nemesis’s increasingly conflict thoughts on her increasingly human behavior. Sidonia has always treated Nemesis like a sister—like a human being. Nemesis has always drawn the line, fully aware that she was created by science to be a killer. The novel touches on the nature vs. nurture debate, and it’s rather thought-provoking. It’s too bad that the rest of the book spends so much time on the excesses and scheming at court because the gray area Nemesis finds herself in, between human and a product of science, provides a really solid plot foundation. Or maybe I’m just feeling this way because I’ve been binge watching Westworld. All in All: The Diabolic turned out to be a very long read for me. I definitely wasn’t expecting the intensive focus on the day-to-day goings-on at the galactic court. I also wanted to know more about the history of this world than what was given. Telling rather than showing was the biggest issue for me, and I won’t be going further with the series. Eh, love the cover art but the genre itself isn't really my thing. And it sounds like this has too much detail. Will totally fail to engage me if that's the case. Happy VDay to you, too, sis! ♥ This had too much detail in places where I felt it wasn't needed and not enough where it did, like the world-building. Womp. Womp. I'm sorry that this didn't live up to the hype for you Lee^^ For some reason, I was never drawn into wanting to read this one and it sounds like that's a good thing. I hate when books are all telling and no showing. It makes for a grueling read.